The Lincoln Chinese Cultural Association (LCCA) held a Spring Festival Celebration on Sunday, February 22, from 12 noon to 4 pm at the AULD Pavilion (Recreation Center) in the Antelope Park (Between 27th and A. Street) at which the Confucius Institute was a co-sponsor. This event was in potluck style and the festive food "Tang Yuan" (rice dumplings) was also served for the occasion. 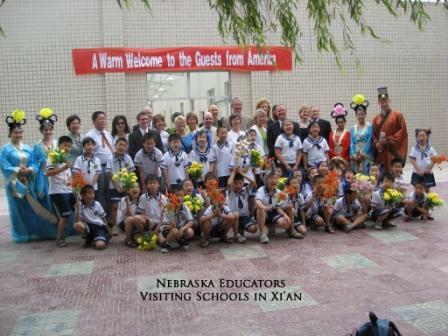 There were performances by student dancers, children's singing group, and Chinese classical music group. Group of students from Omaha Burke High School visiting the Confucius Institute during the day of the Language Fair. UNL Senior Vice Chancellor Dr. Barbara Couture makes opening speech for the Reception. Nebraska Secretary of State Mr. John A. Gale and the Director of World Language Education at the Nebraska Department of Education Ms. Vickie Scow. Contestant Hana McMahon-Cole and Chinese Speech Competition Judge Rebbecca Reinhart. Contestants arrived to register for the Speech Competition. Contestants are preparing their speeches. Two contestants from O'Neil, Nebraska. All prize winners of the Speech Competition, Judges and Confucius Institute Staff. LCCA Chinese traditional instruments performance. UNL Confucius Institute sponsored a Chinese Calligraphy Exhibition given by Zenghan Tong, a Chinese Ph.D. student in the department of Chemistry. The exhibition was held at the Rotunda Gallery in the Nebraska Union on UNL's city campus May 11 - 15, 2009. Ms. Tong was born in the city of Suzhou, Jiangsu Province of China. 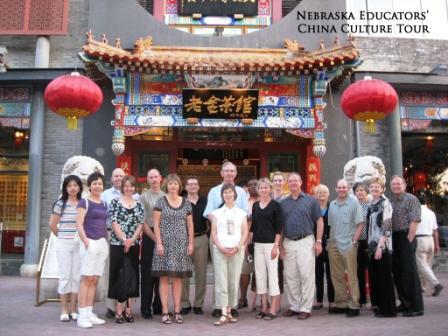 After receiving her bachelor's degree in China, she came to the University of Nebraska-Lincoln in 2005 to study and joined Professor David Hage's research group. Ms. Tong has been passionate about Chinese calligraphy since a very young age. Her teacher, Master Dalin Zhu, a Professor at China Calligraphy College in Japan, currently also serves as the Vice Chairman of Suzhou Calligraphers Association and Vice President of Chinese Dongwu Seal Cutting Society. Ms. Tong has been studying several categories of Chinese scripts: the Official Script (Li), the Regular Script (Kai), the Running Hand (Xing), and her favorite Tablet Inscriptions of the Northern Dynasties (Weibei). Confucius Institute's Chinese instructor Ms. Chunyan Ma lead a group of 5 UNL undergraduate students, Ciera Cappel, Thao Le, Whitney Schwandt, Paula Davis and Katrina Bucknell to China May 9 through June 2, 2009. 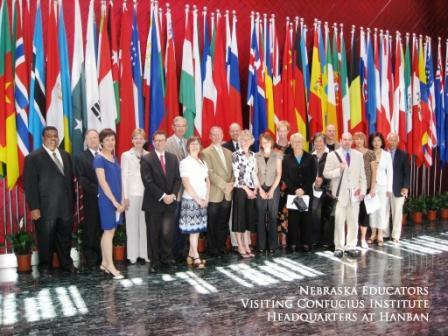 This Chinese language and culture tour was sponsored by Hanban (The Office of Chinese Language Council International), Confucius Institute at UNL, and Xi'an Jiaotong University. 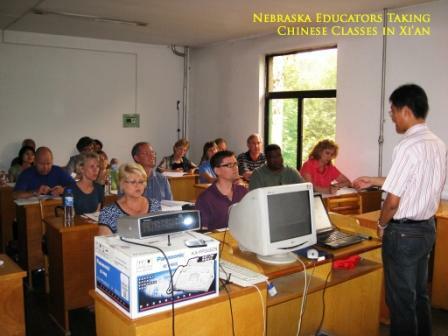 The tour provided opportunities for participants to gain first-hand experiences in Chinese culture, learn Chinese, taste authentic Chinese food, and visit many historical and well-known tourist sites in and around the ancient cities of Xi'an and Beijing which include the Terra Cotta Soldiers Museum, the Great Wall, Forbidden City, and others. Ms. Chunyan Ma and Ms. Lizhen Shi introducing Chinese language and culture to Nebraska high school students who participated in the Department of Modern Languages and Literatures 33rd annual statewide Language Fair on March 12, 2009. Ms. Chunyan Ma teaching Chinese language from the textbook. Ms. Lizhen Shi helping with Chinese calligraphy, writing students names in Chinese. Group of students from Lincoln East High School and Northstar High School visiting the Confucius Institute during the day of the Language Fair.